The cornea is the eye's outermost layer. It is the clear, dome-shaped surface that covers the front of the eye. Although the cornea is clear and seems to lack substance, it is actually a highly organized group of cells and proteins. Unlike most tissues in the body, the cornea contains no blood vessels to nourish or protect it against infection. Instead, the cornea receives its nourishment from the tears and aqueous humor that fills the chamber behind it. The cornea must remain transparent to refract light properly, and the presence of even the tiniest blood vessels can interfere with this process. To see well, all layers of the cornea must be free of any cloudy or opaque areas. The epithelium is the cornea's outermost region, comprising about 10 percent of the tissue's thickness. The epithelium functions primarily to: (1) Block the passage of foreign material, such as dust, water, and bacteria, into the eye and other layers of the cornea; and (2) Provide a smooth surface that absorbs oxygen and cell nutrients from tears, then distributes these nutrients to the rest of the cornea. The epithelium is filled with thousands of tiny nerve endings that make the cornea extremely sensitive to pain when rubbed or scratched. The part of the epithelium that serves as the foundation on which the epithelial cells anchor and organize themselves is called the basement membrane. Lying directly below the basement membrane of the epithelium is a transparent sheet of tissue known as Bowman's layer. It is composed of strong layered protein fibers called collagen. Once injured, Bowman's layer can form a scar as it heals. If these scars are large and centrally located, some vision loss can occur. Beneath Bowman's layer is the stroma, which comprises about 90 percent of the cornea's thickness. It consists primarily of water (78 percent) and collagen (16 percent), and does not contain any blood vessels. Collagen gives the cornea its strength, elasticity, and form. The collagen's unique shape, arrangement, and spacing are essential in producing the cornea's light-conducting transparency. Under the stroma is Descemet's membrane, a thin but strong sheet of tissue that serves as a protective barrier against infection and injuries. Descemet's membrane is composed of collagen fibers (different from those of the stroma) and is made by the endothelial cells that lie below it. Descemet's membrane is regenerated readily after injury. The endothelium is the extremely thin, innermost layer of the cornea. Endothelial cells are essential in keeping the cornea clear. Normally, fluid leaks slowly from inside the eye into the middle corneal layer (stroma). The endothelium's primary task is to pump this excess fluid out of the stroma. Without this pumping action, the stroma would swell with water, become hazy, and ultimately opaque. In a healthy eye, a perfect balance is maintained between the fluid moving into the cornea and fluid being pumped out of the cornea. Once endothelium cells are destroyed by disease or trauma, they are lost forever. If too many endothelial cells are destroyed, corneal edema and blindness ensue, with corneal transplantation the only available therapy. About 120 million people in the United States wear eyeglasses or contact lenses to correct nearsightedness, farsightedness, or astigmatism. These vision disorders--called refractive errors-- affect the cornea and are the most common of all vision problems in this country. Refractive errors occur when the curve of the cornea is irregularly shaped (too steep or too flat). When the cornea is of normal shape and curvature, it bends, or refracts, light on the retina with precision. However, when the curve of the cornea is irregularly shaped, the cornea bends light imperfectly on the retina. This affects good vision. The refractive process is similar to the way a camera takes a picture. The cornea and lens in your eye act as the camera lens. The retina is similar to the film. If the image is not focused properly, the film (or retina) receives a blurry image. The image that your retina "sees" then goes to your brain, which tells you what the image is. Refractive errors are usually corrected by eyeglasses or contact lenses. Although these are safe and effective methods for treating refractive errors, refractive surgeries are becoming an increasingly popular option. It helps to shield the rest of the eye from germs, dust, and other harmful matter. The cornea shares this protective task with the eyelids, the eye socket, tears, and the sclera, or white part of the eye. The cornea acts as the eye's outermost lens. It functions like a window that controls and focuses the entry of light into the eye. The cornea contributes between 65-75 percent of the eye's total focusing power. When light strikes the cornea, it bends--or refracts--the incoming light onto the lens. The lens further refocuses that light onto the retina, a layer of light sensing cells lining the back of the eye that starts the translation of light into vision. For you to see clearly, light rays must be focused by the cornea and lens to fall precisely on the retina. The retina converts the light rays into impulses that are sent through the optic nerve to the brain, which interprets them as images. The refractive process is similar to the way a camera takes a picture. 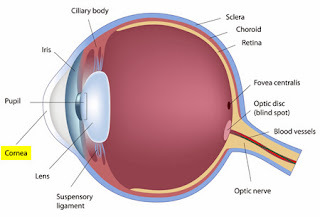 The cornea and lens in the eye act as the camera lens. The retina is similar to the film. If the image is not focused properly, the film (or retina) receives a blurry image. The cornea also serves as a filter, screening out some of the most damaging ultraviolet (UV) wavelengths in sunlight. Without this protection, the lens and the retina would be highly susceptible to injury from UV radiation. How does the cornea respond to injury? The cornea copes very well with minor injuries or abrasions. If the highly sensitive cornea is scratched, healthy cells slide over quickly and patch the injury before infection occurs and vision is affected. If the scratch penetrates the cornea more deeply, however, the healing process will take longer, at times resulting in greater pain, blurred vision, tearing, redness, and extreme sensitivity to light. These symptoms require professional treatment. Deeper scratches can also cause corneal scarring, resulting in a haze on the cornea that can greatly impair vision. In this case, a corneal transplant may be needed. This term describes a group of diseases that cause swelling, itching, burning, and redness of the conjunctiva, the protective membrane that lines the eyelids and covers exposed areas of the sclera, or white of the eye. Conjunctivitis can spread from one person to another and affects millions of Americans at any given time. Conjunctivitis can be caused by a bacterial or viral infection, allergy, environmental irritants, a contact lens product, eyedrops, or eye ointments. This infection is produced by the varicella-zoster virus, the same virus that causes chickenpox. After an initial outbreak of chickenpox (often during childhood), the virus remains inactive within the nerve cells of the central nervous system. But in some people, the varicella-zoster virus will reactivate at another time in their lives. When this occurs, the virus travels down long nerve fibers and infects some part of the body, producing a blistering rash (shingles), fever, painful inflammations of the affected nerve fibers, and a general feeling of sluggishness. Varicella-zoster virus may travel to the head and neck, perhaps involving an eye, part of the nose, cheek, and forehead. In about 40 percent of those with shingles in these areas, the virus infects the cornea. Doctors will often prescribe oral anti-viral treatment to reduce the risk of the virus infecting cells deep within the tissue, which could inflame and scar the cornea. The disease may also cause decreased corneal sensitivity, meaning that foreign matter, such as eyelashes, in the eye are not felt as keenly. For many, this decreased sensitivity will be permanent. Although shingles can occur in anyone exposed to the varicella-zoster virus, research has established two general risk factors for the disease: (1) Advanced age; and (2) A weakened immune system. Studies show that people over age 80 have a five times greater chance of having shingles than adults between the ages of 20 and 40. Unlike herpes simplex I, the varicella-zoster virus does not usually flare up more than once in adults with normally functioning immune systems. Be aware that corneal problems may arise months after the shingles are gone. For this reason, it is important that people who have had facial shingles schedule follow-up eye examinations. More common in women and usually diagnosed between ages 30-50, iridocorneal endothelial (ICE) syndrome has three main features: (1) Visible changes in the iris, the colored part of the eye that regulates the amount of light entering the eye; (2) Swelling of the cornea; and (3) The development of glaucoma, a disease that can cause severe vision loss when normal fluid inside the eye cannot drain properly. ICE is usually present in only one eye. ICE syndrome is actually a grouping of three closely linked conditions: iris nevus (or Cogan-Reese) syndrome; Chandler's syndrome; and essential (progressive) iris atrophy (hence the acronym ICE). The most common feature of this group of diseases is the movement of endothelial cells off the cornea onto the iris. This loss of cells from the cornea often leads to corneal swelling, distortion of the iris, and variable degrees of distortion of the pupil, the adjustable opening at the center of the iris that allows varying amounts of light to enter the eye. This cell movement also plugs the fluid outflow channels of the eye, causing glaucoma. The cause of this disease is unknown. While we do not yet know how to keep ICE syndrome from progressing, the glaucoma associated with the disease can be treated with medication, and a corneal transplant can treat the corneal swelling. This disorder--a progressive thinning of the cornea--is the most common corneal dystrophy in the U.S., affecting one in every 2000 Americans. It is more prevalent in teenagers and adults in their 20s. Keratoconus arises when the middle of the cornea thins and gradually bulges outward, forming a rounded cone shape. This abnormal curvature changes the cornea's refractive power, producing moderate to severe distortion (astigmatism) and blurriness (nearsightedness) of vision. Keratoconus may also cause swelling and a sight-impairing scarring of the tissue. An inherited corneal abnormality. About seven percent of those with the condition have a family history of keratoconus. An eye injury, i.e., excessive eye rubbing or wearing hard contact lenses for many years. Certain eye diseases, such as retinitis pigmentosa, retinopathy of prematurity, and vernal keratoconjunctivitis. Systemic diseases, such as Leber's congenital amaurosis, Ehlers-Danlos syndrome, Down syndrome, and osteogenesis imperfecta. Keratoconus usually affects both eyes. At first, people can correct their vision with eyeglasses. But as the astigmatism worsens, they must rely on specially fitted contact lenses to reduce the distortion and provide better vision. Although finding a comfortable contact lens can be an extremely frustrating and difficult process, it is crucial because a poorly fitting lens could further damage the cornea and make wearing a contact lens intolerable. In most cases, the cornea will stabilize after a few years without ever causing severe vision problems. But in about 10 to 20 percent of people with keratoconus, the cornea will eventually become too scarred or will not tolerate a contact lens. If either of these problems occur, a corneal transplant may be needed. This operation is successful in more than 90 percent of those with advanced keratoconus. Several studies have also reported that 80 percent or more of these patients have 20/40 vision or better after the operation. The National Eye Institute is conducting a natural history study--called the Collaborative Longitudinal Evaluation of Keratoconus Study-- to identify factors that influence the severity and progression of keratoconus. Lattice dystrophy gets its name from an accumulation of amyloid deposits, or abnormal protein fibers, throughout the middle and anterior stroma. During an eye examination, the doctor sees these deposits in the stroma as clear, comma-shaped overlapping dots and branching filaments, creating a lattice effect. Over time, the lattice lines will grow opaque and involve more of the stroma. They will also gradually converge, giving the cornea a cloudiness that may also reduce vision. In some people, these abnormal protein fibers can accumulate under the cornea's outer layer--the epithelium. This can cause erosion of the epithelium. This condition is known as recurrent epithelial erosion. These erosions: (1) Alter the cornea's normal curvature, resulting in temporary vision problems; and (2) Expose the nerves that line the cornea, causing severe pain. Even the involuntary act of blinking can be painful. To ease this pain, a doctor may prescribe eye drops and ointments to reduce the friction on the eroded cornea. In some cases, an eye patch may be used to immobilize the eyelids. With effective care, these erosions usually heal within three days, although occasional sensations of pain may occur for the next six-to-eight weeks. By about age 40, some people with lattice dystrophy will have scarring under the epithelium, resulting in a haze on the cornea that can greatly obscure vision. In this case, a corneal transplant may be needed. Although people with lattice dystrophy have an excellent chance for a successful transplant, the disease may also arise in the donor cornea in as little as three years. In one study, about half of the transplant patients with lattice dystrophy had a recurrence of the disease from between two to 26 years after the operation. Of these, 15 percent required a second corneal transplant. Early lattice and recurrent lattice arising in the donor cornea responds well to treatment with the excimer laser. Although lattice dystrophy can occur at any time in life, the condition usually arises in children between the ages of two and seven. This dystrophy occurs when the epithelium's basement membrane develops abnormally (the basement membrane serves as the foundation on which the epithelial cells, which absorb nutrients from tears, anchor and organize themselves). When the basement membrane develops abnormally, the epithelial cells cannot properly adhere to it. This, in turn, causes recurrent epithelial erosions, in which the epithelium's outermost layer rises slightly, exposing a small gap between the outermost layer and the rest of the cornea. Epithelial erosions can be a chronic problem. They may alter the cornea's normal curvature, causing periodic blurred vision. They may also expose the nerve endings that line the tissue, resulting in moderate to severe pain lasting as long as several days. Generally, the pain will be worse on awakening in the morning. Other symptoms include sensitivity to light, excessive tearing, and foreign body sensation in the eye. Map-dot-fingerprint dystrophy, which tends to occur in both eyes, usually affects adults between the ages of 40 and 70, although it can develop earlier in life. Also known as epithelial basement membrane dystrophy, map-dot-fingerprint dystrophy gets its name from the unusual appearance of the cornea during an eye examination. Most often, the affected epithelium will have a map-like appearance, i.e., large, slightly gray outlines that look like a continent on a map. There may also be clusters of opaque dots underneath or close to the map-like patches. Less frequently, the irregular basement membrane will form concentric lines in the central cornea that resemble small fingerprints. Typically, map-dot-fingerprint dystrophy will flare up occasionally for a few years and then go away on its own, with no lasting loss of vision. Most people never know that they have map-dot-fingerprint dystrophy, since they do not have any pain or vision loss. However, if treatment is needed, doctors will try to control the pain associated with the epithelial erosions. They may patch the eye to immobilize it, or prescribe lubricating eye drops and ointments. With treatment, these erosions usually heal within three days, although periodic flashes of pain may occur for several weeks thereafter. Other treatments include anterior corneal punctures to allow better adherence of cells; corneal scraping to remove eroded areas of the cornea and allow regeneration of healthy epithelial tissue; and use of the excimer laser to remove surface irregularities. Herpes of the eye, or ocular herpes, is a recurrent viral infection that is caused by the herpes simplex virus and is the most common infectious cause of corneal blindness in the U.S. Previous studies show that once people develop ocular herpes, they have up to a 50 percent chance of having a recurrence. This second flare-up could come weeks or even years after the initial occurrence. Ocular herpes can produce a painful sore on the eyelid or surface of the eye and cause inflammation of the cornea. Prompt treatment with anti-viral drugs helps to stop the herpes virus from multiplying and destroying epithelial cells. However, the infection may spread deeper into the cornea and develop into a more severe infection called stromal keratitis, which causes the body's immune system to attack and destroy stromal cells. Stromal keratitis is more difficult to treat than less severe ocular herpes infections. Recurrent episodes of stromal keratitis can cause scarring of the cornea, which can lead to loss of vision and possibly blindness. Like other herpetic infections, herpes of the eye can be controlled. An estimated 400,000 Americans have had some form of ocular herpes. Each year, nearly 50,000 new and recurring cases are diagnosed in the United States, with the more serious stromal keratitis accounting for about 25 percent. In one large study, researchers found that recurrence rate of ocular herpes was 10 percent within one year, 23 percent within two years, and 63 percent within 20 years. Some factors believed to be associated with recurrence include fever, stress, sunlight, and eye injury. The National Eye Institute supported the Herpetic Eye Disease Study, a group of clinical trials that studied various treatments for severe ocular herpes. Pterygia are more common in sunny climates and in the 20-40 age group. Scientists do not know what causes pterygia to develop. However, since people who have pterygia usually have spent a significant time outdoors, many doctors believe ultraviolet (UV) light from the sun may be a factor. In areas where sunlight is strong, wearing protective eyeglasses, sunglasses, and/or hats with brims are suggested. While some studies report a higher prevalence of pterygia in men than in women, this may reflect different rates of exposure to UV light. Because a pterygium is visible, many people want to have it removed for cosmetic reasons. It is usually not too noticeable unless it becomes red and swollen from dust or air pollutants. Surgery to remove a pterygium is not recommended unless it affects vision. If a pterygium is surgically removed, it may grow back, particularly if the patient is less than 40 years of age. Lubricants can reduce the redness and provide relief from the chronic irritation. Stevens-Johnson Syndrome (SJS), also called erythema multiforme major, is a disorder of the skin that can also affect the eyes. SJS is characterized by painful, blistery lesions on the skin and the mucous membranes (the thin, moist tissues that line body cavities) of the mouth, throat, genital region, and eyelids. SJS can cause serious eye problems, such as severe conjunctivitis; iritis, an inflammation inside the eye; corneal blisters and erosions; and corneal holes. In some cases, the ocular complications from SJS can be disabling and lead to severe vision loss. Scientists are not certain why SJS develops. The most commonly cited cause of SJS is an adverse allergic drug reaction. Almost any drug--but most particularly sulfa drugs--can cause SJS. The allergic reaction to the drug may not occur until 7-14 days after first using it. SJS can also be preceded by a viral infection, such as herpes or the mumps, and its accompanying fever, sore throat, and sluggishness. Treatment for the eye may include artificial tears, antibiotics, or corticosteroids. About one-third of all patients diagnosed with SJS have recurrences of the disease. SJS occurs twice as often in men as women, and most cases appear in children and young adults under 30, although it can develop in people at any age. What is a corneal transplant? Is it safe? In corneal transplant surgery, the surgeon removes the central portion of the cloudy cornea and replaces it with a clear cornea, usually donated through an eye bank. A trephine, an instrument like a cookie cutter, is used to remove the cloudy cornea. The surgeon places the new cornea in the opening and sews it with a very fine thread. The thread stays in for months or even years until the eye heals properly (removing the thread is quite simple and can easily be done in an ophthalmologist's office). Following surgery, eye drops to help promote healing will be needed for several months. Corneal transplants are very common in the United States; about 40,000 are performed each year. The chances of success of this operation have risen dramatically because of technological advances, such as less irritating sutures, or threads, which are often finer than a human hair; and the surgical microscope. Corneal transplantation has restored sight to many, who a generation ago would have been blinded permanently by corneal injury, infection, or inherited corneal disease or degeneration. What problems can develop from a corneal transplant? Even with a fairly high success rate, some problems can develop, such as rejection of the new cornea. Warning signs for rejection are decreased vision, increased redness of the eye, increased pain, and increased sensitivity to light. If any of these last for more than six hours, you should immediately call your ophthalmologist. Rejection can be successfully treated if medication is administered at the first sign of symptoms. A study supported by the National Eye Institute (NEI) suggests that matching the blood type, but not tissue type, of the recipient with that of the cornea donor may improve the success rate of corneal transplants in people at high risk for graft failure. Approximately 20 percent of corneal transplant patients--between 6000-8000 a year--reject their donor corneas. The NEI-supported study, called the Collaborative Longitudinal Evaluation of Keratoconus Study-- , found that high-risk patients may reduce the likelihood of corneal rejection if their blood types match those of the cornea donors. The study also concluded that intensive steroid treatment after transplant surgery improves the chances for a successful transplant.